dsPIC33F DMAC dsPIC3F DMAC family includes special debug assist registers that improve user visibility from any mode, but most importantly during system debugs. 70 MIPS dsPIC33EP and PIC24EP Family Overview An overview of the features and applications 70 MIPS dsPIC33EP and PIC24EP family. 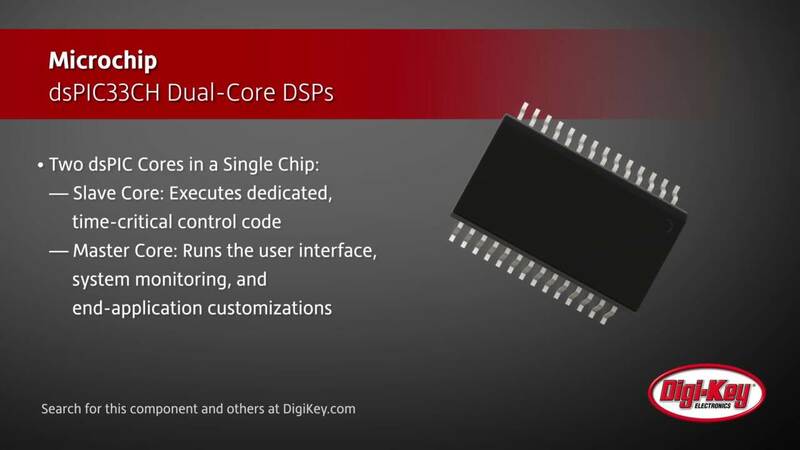 dsPIC®33 Digital Signal Controllers Microchip's dsPIC DSC core is designed to execute digital filter algorithms and high-speed precision digital control loops. Interface Solutions Microchip offers interface solutions including real-time clocks and calendars, Ethernet, LIN Bus transceivers, and USB products. dsPIC33EP Series DSCs for Motor Control, Digital Power and Sensing Microchip's dsPIC33EP series DSCs for controlling brushless DC, permanent magnet synchronous, AC induction, and stepper motors. Synchronizing Small-Scale PV Systems with the Grid Highly-integrated MCUs from suppliers including ADI, TI, and Freescale, offer designers the ability to create effective PLL grid-synchronization algorithms. USB Connectivity for MCUs: Which is Right for Your Next Design? Review of USB basics along with the key features and differentiated functions available in the MCU families. Anti-Islanding and Smart Grid Protection Anti-islanding protection is essential to ensure that grid-tied energy harvesting systems cut their connection to the grid when the grid itself loses power.